It's been a while since I've shared an Operation: Love Reunited session ... and I don't know why. Look how cute this family is! These two gorgeous big sisters just rocked the camera and lil' sister was a smiles throughout the whole session. I couldn't have asked for a better family to photograph! *Last name on hat has been removed to protect the privacy of the family. OpLove is a non-profit, fully volunteer organization that offers professional photography sessions to military families and members who are getting ready to deploy, who are currently deployed, or those who are coming home. Families may receive two sessions per year. The session choices are Pre-Deployment (with the servicemember), Saying Goodbye (documentary style at the farewell location), or an Already Deployed (servicemember has already deployed), and then a Homecoming (documentary style at the homecoming location.) ALL sessions shall follow a patriotic theme. Pre-Deployment sessions includes a uniformed servicemember with the option to change clothes later in the session. "M" family album that was sent overseas to their hero. Best part of taking this family's portraits? When their hero received their album and said, "it brought a smile to his face." While in country, his computer crashed and he lost all of the family photos he had on there. I was able to send him some love from his family in portraiture to let him know he is missed and very loved. I couldn't ask for a better way to give back to our military servicemembers. 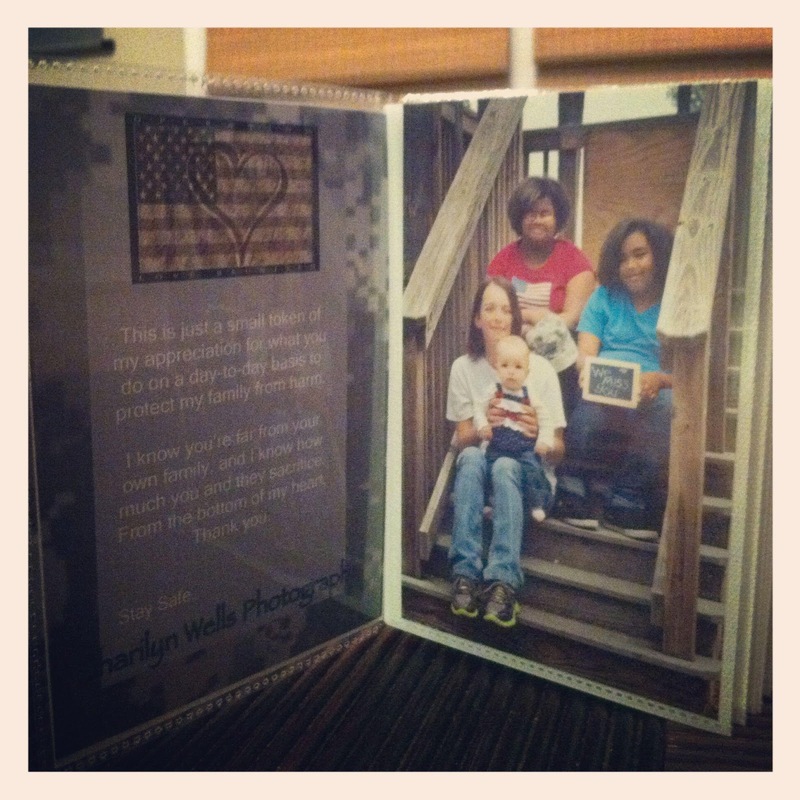 Pre-Deployment or Deployment Sessions include a 4x6 album of at least 15 images that will be sent overseas to the deployed servicemember for an extra special boost of moral. Albums will not be given to family members. If a Saying Goodbye session is desired, a CD of final documentary style of at least 15 images will be given to the family for them to decide what to do with the images since these images can be very emotionally draining. 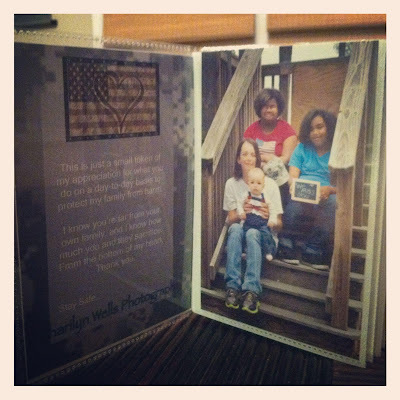 Homecoming sessions include a CD of at least 15 final documentary style images for the family to keep. 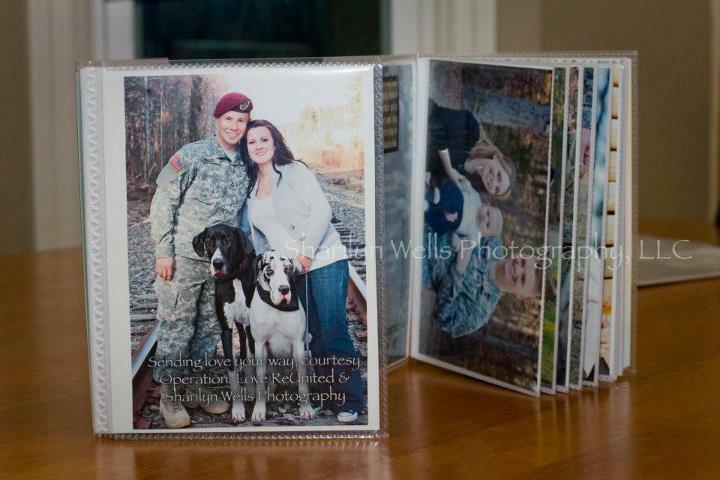 Prints may be purchased after the OpLove obligation is complete through SWP with a 10% military discount. Image CDs are excluded from the discount. Examples of albums sent overseas.